Treatment must start immediately. The longer the delay, the longer will be the duration of the attack. Ask the patient what their personal emergency treatment plan is. They differ. Each patient should have there own acute attack action plan with treatments to be given outlined by their treating specialist. Do not administer Adrenalin, Antihistamines or Glucocorticoids. 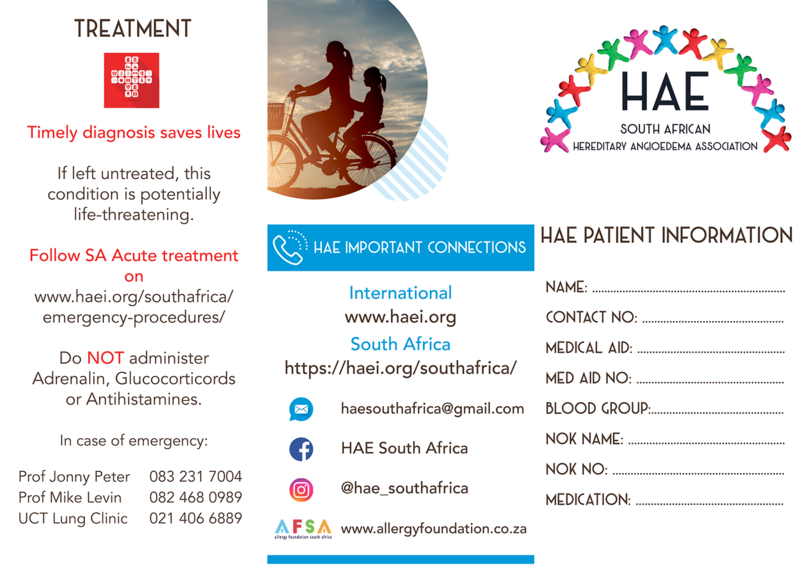 They do not work because HAE is not an allergy.Patients may have their own medication with them which will need to be infused. This will be a targeted therapy of C1-inhibitor, either the plasma-derived product (trade-name: Berinert) or a recombinant product (trade name:Ruconest). There are also a few patients in SA that have access to the Bradykinin B2 receptor antagonist – Icantibant (Trade name: Firzyr); this is administered subcutanouesly. None of these are registered products in SA and therefore, patients will have obtained this through SAHPRA approval on a named patient basis. If there are no other treatment options available use Fresh Frozen Plasma or even freeze-dried plasma (Bioplasma manufacturer by local SA fractionator National Bioproduct Institute).